I really wish you guys could have seen my reaction to getting a package in the mail. My hubby said he is going to video it next time because you all just have to see it. I just get so excited with these! We checked the mail when we were on our way home from dinner. I had to open it in the car because I just couldn't wait another second!! 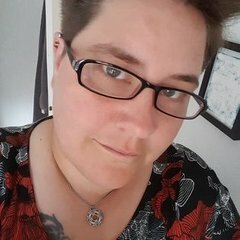 Thank you so much FGM in Ohio!! You have made my week!! 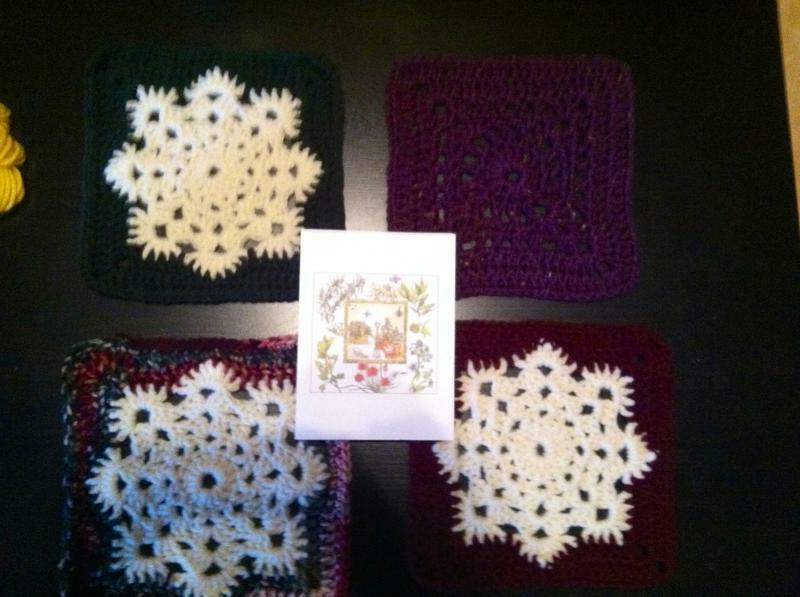 I received these four beautiful squares with a very nice note!! They are so soft too. Sorry the lighting isn't too great! They are wonderful though!! 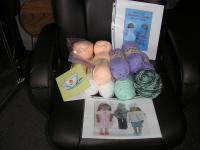 Thank you so much to another bff from FL, for the fabulous package she sent me. 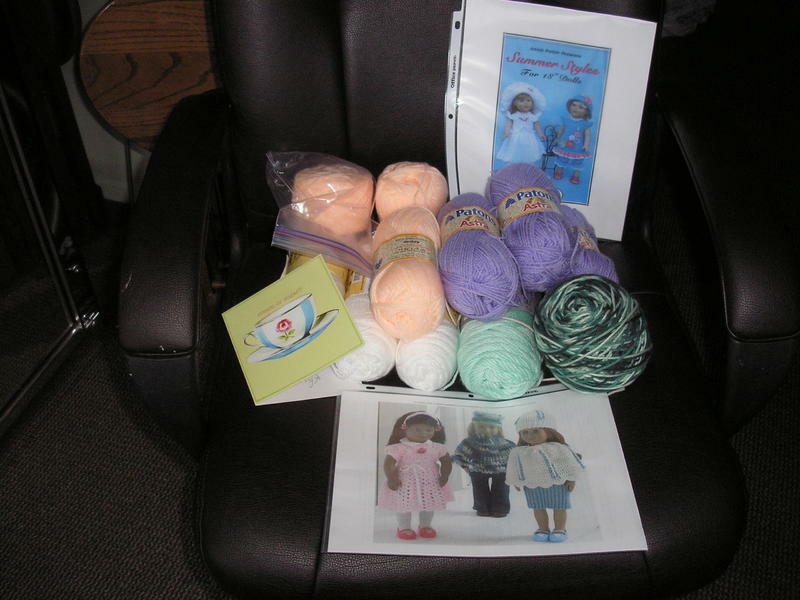 I love the AG doll patterns and the yarn is so pretty and soft. I can't wait to start a new project, but I am in the middle of one now. But soon . . .
A very thoughtful NY FGM sent me boots and sneakers for my 18" doll donation project. This couldn't have come at a better time as one of my long time helpers has made the choice to enter hospice and nearly broke my heart when she told me she was going to continuing working on a dress she promised me for Christmas, she is just waiting for her husband to drop off her bag. :dayAfter work today I got on my computer and found a surprise. A wonderful FGM gifted me the Sock Monkey Lovey that I wanted. Now I am on . Can't wait to get started on it! SO MUCH!!! A very lovely FGM in the UK sent me the galoshes pattern I wished for! Thank you ever so much FGM for making my day! Thank you soooooo much to my wonderful UK FGM who so generously gifted me the pattern I wanted for the Crocodile Stitch Hood! I can't wait to start it as I hope to make it for my mom for Christmas!!!! A FGM from KY sent me a wonderful pink crocheted hat and bracelet for my friend with breast cancer. She also made me a matching bracelet. Loved your note as well. A few minutes ago I took my yorkie for a walk-as I opened the front door my mail was sitting there wwith a small package-I assumed it was the part we are expecting to repair for our oven that broke down last week. I then saw it was from a special FGM in Florida....wow!!! It made my day !!! Thank you for being you !! Just got home from a little mini vacation and there was the nicest note from a fairygodmother in TX in the mail. I will be writing you back soon. Hoping we can keep writing once in a while - nice to get fun mail. Have to give a big ol' thanks to a FGM in MN for the awesome sticky notes.!!!!! You have no idea how I go through them. And I loved reading your note. Just felt like two old friends checking in on each other. AND a thanks to a terrific FGM in the great state of Texas!! Those coupons will definitely go to good use!!! Thank You to 2 Fairy GodMothers!! I received a wonderful post card from Houston, Texas. It's pretty and looks too busy for me, so I will just enjoy the card! I got a box of SPIDERS!!! EEEKKKKKKKKKKKKKK!!!!!!!!!!!!!!!!!!! 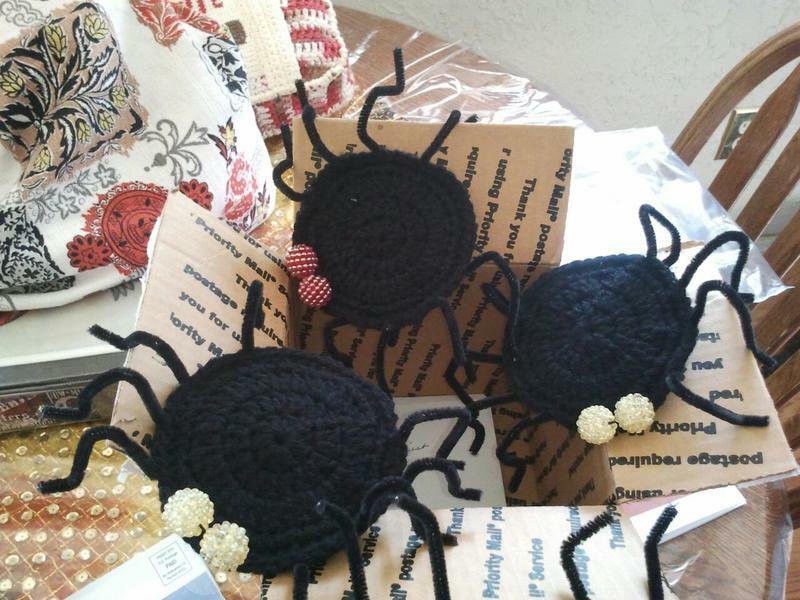 I hope these HUGE spiders (coasters) will actually scare off the real wolf spiders that we have been finding in the house because of the heat. Once I get the pic's from camera to here, I will post them. Thank You Both, really made my day. 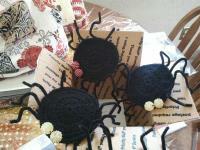 Thank you to my wonderful FL Fairy God-Mother for the needle case I have had on my wishlist forever. It really means a lot to me. I know it might see silly to be so thrilled about a needle case but there is childhood a story behind it as to why it meant so much. 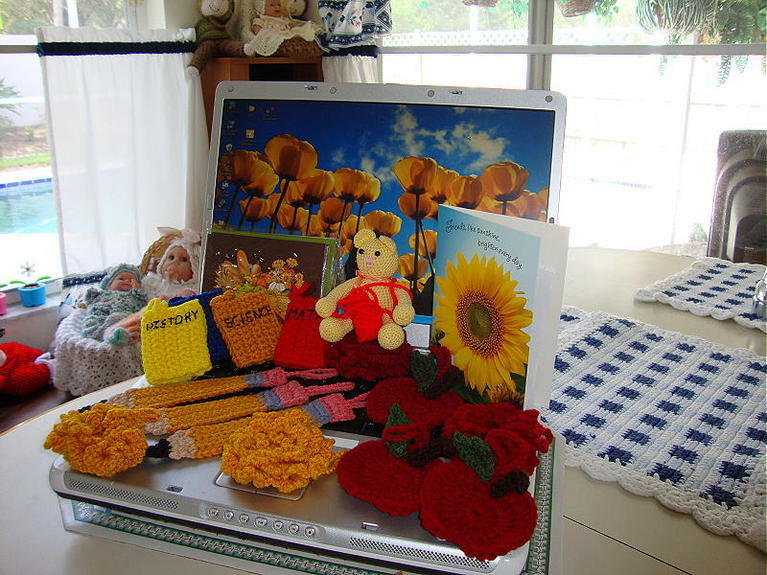 My grandmother on my dad's side use to do a lot of needle point, crochet and knitting and had a case like this. She knew how much I was fascinated by it when I was a little girl and had promised it to me when she passed as well as her crochet hooks. (she tried to teach me when I was young but i never had the patience to learn then). Well long story short, she passed when I was 16 and I never did receive it. It, along with all her craft things, were tossed out and I was heartbroken. This little needle case reminds me of her so its like having a piece of her back. THANK YOU SO MUCH FL FGM!!!!! Thank you to my FGM in Houston. She sent a post card, and told me all about her favorite things in the city. It looks like a beautiful city. Another card to add to my book. Thanks again. Thanks FGM for the nice postcard I got today! I'll send one back soon! So fun to get mail!! I want to thank my 2 FGMs that PM'd me pie recipes! Labor Day weekend is coming up with all sorts of barbeque's and picnics for me to bring them to! And thank you also for the shrug pattern, once I'm done with Christmas presents, I'll get right on that one! Thank you, thank you, thank you to a special FGM from FL who made me two of the most adorable owls and a couple of cute stitch markers as well as a letter about her state. You made my morning. Thank you!! I will add photo's when my daughter let's me on the computer. Yesterday in the mail I got a wonderful package from my FGM in MO. 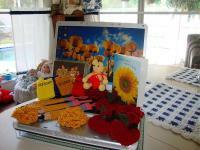 It had 3 pencils, 4 books, 3 apples and 3 mums, along with some note cards and a wonderful long note. These are all for my September tree. 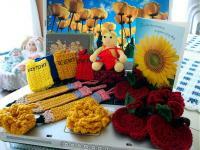 Oh and I was told in the note that her adopted kitty kept stealing the mums, thought they belonged in her toy box. So just to show her, that my kitty likes them too. Thank you, Thank you, Thank you so much for the ornaments and the chuckle. I recieved a wonderful package from My FGM and new friend. In the package was a wonderfluly chatty letter a card and hanging towels. But I have to say What touched me the most was the fact that you took the time to put together presents for my twins. 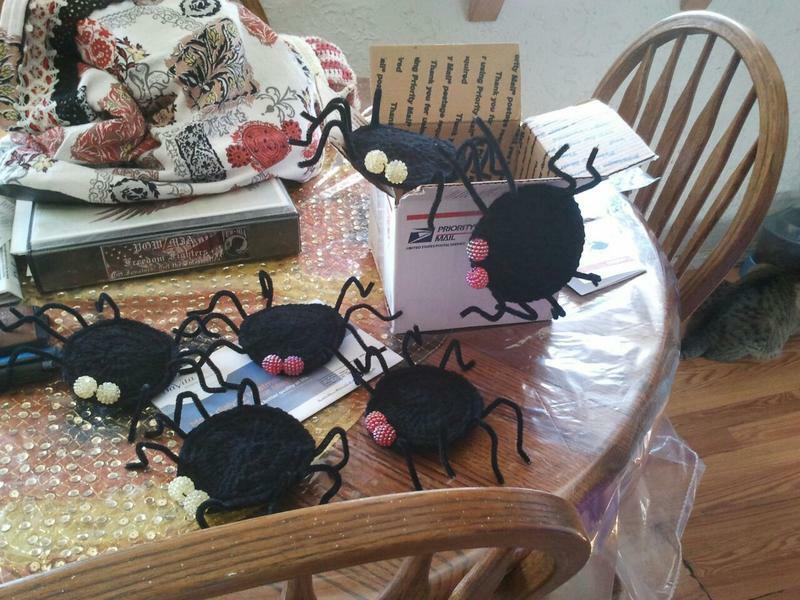 They love the stencels and the beads and wanted me to tell my new friend that they love all of the stuff you sent them. Thank you so much for all that you sent! I am sorry that it took so llong to get this posted but with it being a birthday weekend and getting them back to school I felt like I was always behind. Boy, I got a surprise today! A new friend from NC sent me a wonderful package that I recieved in the mail today. 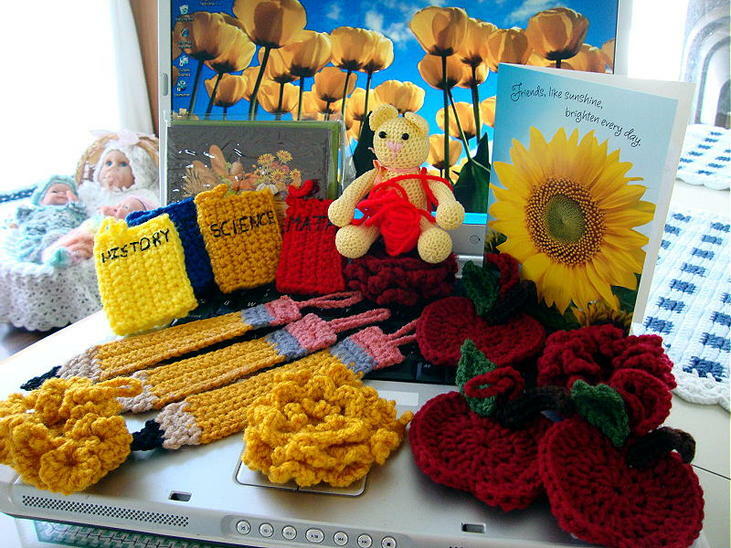 She sent me wonderful hand written note ( a dying art) two beautiful backages of buttons ( soft colorful flower buttons, two round quarter size buttons made in Portugal), hand lotion and a GREAT book for crocheted totes. She also sent me some wonderful smelling hand lotion from my favorite place to buy girly stuff Bath and Body Works. Thank you so much for thinking of me! Have a wonderful week-end! :hugBy the way your handwriting is not bad, I think it is very pretty!